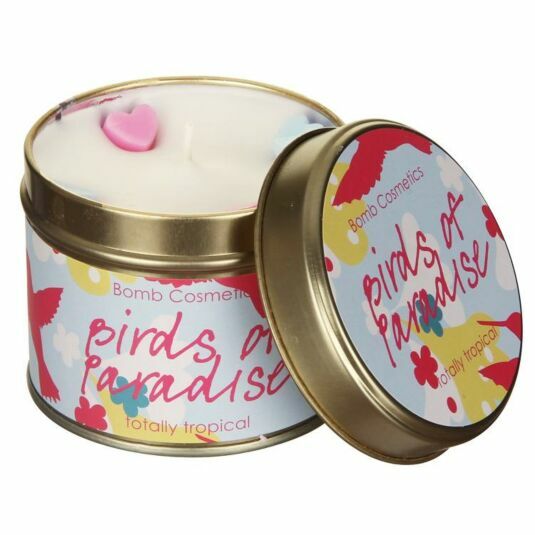 A fruity mix of grapefruit and mandarin let this scent swoop you away to a tropical place. This candle has added grapefruit and mandarin essential oils which are perfect for creating an energized and stress-free atmosphere. The candle is white in colour and has small light blue and pink 3D hearts around the edge. It is presented in a gold coloured tin which is decorated with tropical imagery and the words ‘Birds of Paradise’ and ‘totally tropical’. These will look great displayed in any room and would make a great gift for a friend or loved one.